We all submit ourselves to the hard seating of bleachers when we attend school or professional sporting activities. These uncomfortable structures are among the most cost-effective ways to provide mass-seating, so spectators are often required to climb and sit on them. When bleachers are poorly designed, however, their users – young children in particular – run the risk of suffering serious fall injuries. Unsuspecting individuals may fall off, through, or onto bleachers that have not been outfitted with proper safety features. 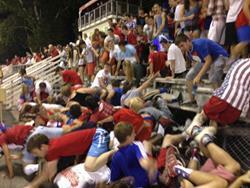 If your child has been injured in a bleacher fall, you may be entitled to compensation from those responsible. Child bleacher-fall lawyer Jeff Killino has the experience and reputation necessary to effectively present your case in court. Contact him today at 877-875-2927 to learn more about your legal options. Who is to blame for your child’s injury? Despite certain states’ laws setting bleacher standards, and despite the Consumer Product Safety Commission’s (CPSC’s) published guidelines to retrofit bleachers into safer structures, over 15,000 children under the age of 15 are injured in bleacher accidents each year. Schools, stadiums, and other businesses that fail to protect their visitors by providing safe seating areas are negligently putting these people at risk. Bleacher-fall injuries may be caused by defects in bleachers themselves, inadequate assembly, or the negligence of entities or individuals responsible for bleacher maintenance. In some cases, injuries may be caused by a combination of negligence and a defect in the product or one of its component parts. If a management company responsible for the conditions of bleachers on particular property fails to provide for repair or replacement of bleachers that are no longer safe for use, the owner and/or management company may be held liable in a negligence action for injuries suffered by a child as a result of the poor condition of the bleachers in question. Management companies must take steps to ensure that bleachers comply with the most up-to-date industry and municipal-code requirements. Property owners may also be held liable in negligent actions for failure to provide for repair or replacement of aged and unsafe bleachers or for the installation of newer bleachers that are improperly assembled or otherwise unsafe. Property owners are also responsible for ensuring that bleachers erected and present on their premises meet current industry standards and applicable municipal codes. Owners of property on which bleachers are present are also responsible for keeping bleacher surfaces free of debris or otherwise dangerous conditions, such as ice, water, and other slippery substances. Property owners may be held liable for injuries that occur on a property owner’s premises under the law of premises liability. Owners may be public or private individuals or entities, such as public or private schools, or owners of premises on which professional sports or music events are held. The identity of and type of owner may affect the existence and extent of liability for damages sustained on the owner’s premises. The identity and type of plaintiff may affect owner-liability, as well. Under the premises-liability law of most states, the plaintiff’s classification as an invitee, a licensee, or a trespasser will affect the duty owed by a property owner to that plaintiff. In most states, property-owners are held to a duty to exercise reasonable care under certain circumstances to individuals who have been invited onto or given permission to come onto the owner’s land. Property-owners are not generally held to such a duty with respect to trespassers, however. When property-owners are not aware of a trespasser’s presence on the property-owner’s land, the property-owner generally will be held to have had no duty to exercise reasonable care for the trespasser’s safety. If the owner is aware of the trespasser’s presence, however, a duty may be found to have arisen to warn the trespasser of dangerous conditions and to take reasonable precautions to keep the trespasser safe while he or she is on the premises. In some cases, property-owners have been found to have such a duty even before a trespasser arrives on the owner’s land, when the owner knew or had reason to believe that a trespasser would come onto the owner’s land. If poor installation or assembly of bleachers is found to have been a cause of a child’s bleacher-fall injury, the individuals or entities responsible for such installation and/or assembly may be liable in negligence for damages sustained as a result of those injuries. In addition, the individual or company that hired an installer or assembler whose negligence resulted in a child’s injuries may also be held liable, in some case, for the injuries sustained. If a defect in a set of bleachers of any of its component parts is found to have been a cause of a child’s bleacher-fall injury, the manufacture of the bleachers or the defective component part, as well as anyone else in the chain of the product’s distribution, may be held liable in a product-liability action for damages suffered as a result of those injuries. Bleachers can be defective in manufacture or design, or by virtue of a failure to provide adequate warning and instructions necessary for their safe use. If bleachers have been designed without hand-rails or aisles, for example, the manufacturer and anyone in the chain of distribution may be found liable in a product-liability action if the design defect is found to have been a cause of a child’s bleacher-fall injury. Even if bleachers have been safely designed, a manufacturer and anyone in the chain of distribution may be held liable in a product-liability action for a child’s bleacher-fall injuries if the bleachers from which the child fell are determined to have been defectively manufactured. Guardrails made with defective materials, for example, may be found to constitute such a defect. Manufacturers may also be found liable for injuries caused to a child in a bleacher-fall accident if a failure to provide adequate warnings or instructions regarding the assembly of bleachers is found to have been a cause of the child’s bleacher-fall injury. Bleacher falls are tragic events for both the victim and the victim’s family. If your child has been injured in one of these devastating events, contact child bleacher-fall lawyer Jeff Killino at 877-875-2927 for expert and dedicated assistance in pursuing the justice to which you are entitled.